(11:40 a.m. EDT) -- Wondering what 31 days in dry dock can do a cruise ship? 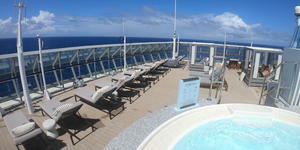 We've just spent two days onboard Celebrity Summit to get a first look at the ship following its "Celebrity Revolution" makeover -- part of a $500 million initiative to inject new life into several of the line's older ships, drawing inspiration from Celebrity Edge, which launched in fall 2018. During the past month at Grand Bahama shipyard, Celebrity Summit saw the redesign of all its cabins, the spa and several restaurants, lounges and public spaces, as well as the addition of an exclusive Sun Deck for suite passengers. 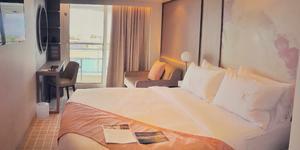 The ship now boasts a more modern look and luxurious feel, without the stuffiness. Read on for our first impressions of Celebrity Summit's most note-worthy changes. Celebrity Summit will continue to sail Eastern and Southern Caribbean itineraries from San Juan, Puerto Rico, as well as cruises to Bermuda and Canada/New England (or both) from Cape Liberty, New Jersey, through 2019. In 2020, the ship also will offer cruises from Charleston and Boston. Acclaimed interior designer Kelly Hoppen -- the brains behind the staterooms on Celebrity Edge -- also developed the look on Celebrity Summit. All accommodations feature a contemporary design, with standard cabins dolled up in light neutral and blush color scheme and suites sporting their own pops of color. This design will be unique to the line's Millennium-class ships, all of which will undergo Celebrity Revolution refurbs; standard cabins on Solstice-class ships will be done up in a neutral and blue color scheme. Cabins also boast new finishings such as faux marble walls and soft-close cabinetry with under-lighting effects. Beyond the interior design, however, the cabins were upgraded with a slew of modern conveniences that might not be noticeable at first glance. Among them are the addition of USB ports and more power outlets, new cashmere mattresses, maximized storage space and RFID door-entry technology. With the investments in RFID and other tech-friendly features, one might wonder why the line didn't bother to install key card-activated light switches in the cabins -- an environmentally friendly feature being added to more and more ships. In a press conference held onboard, the line's senior vice president of hotel operations, Brian Abel, explained why the line intentionally left the technology out of its design plans, cheekily saying they don't find it to be the most efficient system as passengers often slip business cards inside the switch to keep their electronics powered. Celebrity Summit passengers staying in suites now have another perk to add to their list of inclusions: The Retreat Sun Deck. The sun deck complements the newly designed suite lounge (formerly Michael's Club) and suite-only restaurant Luminae, which now features menu items developed by new Celebrity Cruises partner, NYC-based chef Daniel Boulud. Another Hoppen design, the sun deck is a new exclusive space accessible only to passengers staying in Sky Suites and above. The area is small, but it's well-laid out with a central hot tub and two levels of lounging space. Seating arrangements range from padded deck chairs and shaded cabanas to beanbag loungers and larger couches. There also is no bar, but guests can order drinks from a menu through dedicated Retreat servers who provide more intimate service. 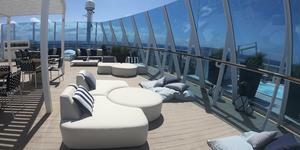 The sun deck replaces what Celebrity described as an underutilized space Deck 12, at the front of the ship. 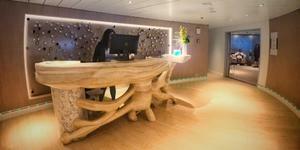 Meanwhile, the suite lounge on Deck 4 also was completely transformed. It now boasts a bright, airy, modern design -- a drastic (and refreshing) improvement compared to the dark wood-paneled look that was there before. Additionally, our cruise was the first to debut the new Boulud menu in Luminae, offered in addition to the restaurant's regular offerings. We had a chance to sample a couple of the dishes. Unfortunately, the general consensus was mixed; the dishes weren't necessarily poor in quality or presentation, but they weren't praise-worthy, either. We're told the rollout is still a work in progress, so we expect the execution to improve over time. More revolutionary changes can be seen in Celebrity Summit's spa, where the reception area, Persian Garden thermal suite, treatment rooms, salon, fitness center and locker rooms were all updated -- whether with a new look, or simply new finishings. The reception area now welcomes passengers with a Scandinavian-inspired design, while the Persian Garden boasts a lighter, more calming color scheme as well as a new salt therapy room that uses the salt's microparticles to promote healthier skin and easier breathing. A new space also was created in the fitness center, for personal training and consultations. Celebrity touts its new spa design as "wellness-focused." Although most of the spa updates made during this refurb were cosmetic, we think the term is accurate given the line's longstanding emphasis on mindfulness, through a variety of yoga classes, guided meditation classes and unique treatments. 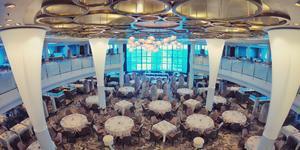 Leave it to Celebrity Cruises to design one of the most Instagram-worthy dining rooms we've ever seen. The Cosmopolitan Restaurant -- Celebrity Summit's complimentary, "default" dinner option -- received a total makeover, going from a dark wood and maroon layout with basic banquet furniture to a contemporary yet whimsical design with light, soft tones and elegant touches such as floral-designed sconce lights and throne-like chairs. Elsewhere throughout the ship, modernizations were made to the buffet (new furnishings and a more open floor plan, for a better flow); Sunset Bar (new, stylish seating arrangements); Rendezvous Lounge (new carpeting and other cosmetic updates); and casino (redesigned bar and new slot machines). 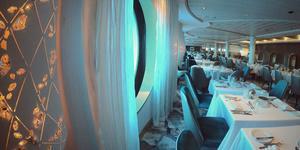 While Celebrity Summit now embodies a more modern and high-end look, it still feels like the same ship. What surprised us most was the scale of the changes that were made. No detail was spared in any of the spaces that were touched; Celebrity considered every amenity one might desire, especially in the cabins. With Celebrity Millennium and Celebrity Summit now complete, the next ship to enter dry dock is Celebrity Equinox, which will be unveiled on June 1, 2019. The remaining expected reveal dates are: Celebrity Silhouette (January 31, 2020), Celebrity Constellation (May 24, 2020), Celebrity Infinity (November 15, 2020), Celebrity Eclipse (November 24, 2020), Celebrity Solstice (October 29, 2021) and Celebrity Reflection (February 3, 2023). Celebrity says it will continue to draw inspiration from Celebrity Edge, aiming for a consistent look and feel across the fleet.